Squash blossoms in October may seem out of step but they're still available down here in sunny Southern California so I'd be a fool not to take advantage of them. I particularly like them stuffed with goat cheese, lightly battered and then fried. The flavor is reminiscent of fried zucchini (not surprising since they are the blooms off the zucchini) and the warm, creamy goat cheese center oozing out as you take a bite, is just a little bit of heaven on earth to me. That's John Sweredoski from Sweredoski Farms - I think you can see what an animated fellow he is! Below are his lovely squash blossoms which he intends to have through late November. You can find the Sweredoski Farms stand at the Irvine Center Farmer's Market in Irvine, CA every Saturday morning. To prepare the squash blossoms for stuffing and frying, I removed the stamen from the inside of each bloom by reaching down into the bloom and plucking out. Then I rinsed thoroughly and allowed to dry completely. Next I put a small amount of goat cheese in the center of each bloom and then twisted the bloom closed at the end. Heat oil in skillet over medium to medium-high heat until about 375 degrees F. You'll be able to tell it's hot enough by dipping the tip of a battered squash blossom in and it immediately starts to sizzle. Next, in a shallow bowl mix the salt with the flour. In a separate shallow bowl place the egg wash. Dip each stuffed squash blossom into egg wash first, then flour, then set aside. When all are battered, begin frying them a few at a time. Do not overcrowd pan. Fry for approximately 1-3 minutes or until they are lightly browned. Gently turning over halfway through to be sure both sides are browned. Remove from oil and place on paper towels or paper bag to soak up excess oil, and sprinkle with sea salt. Serve while still warm. Fried Squash Blossoms Stuffed with Goat Cheese - yummmmm! 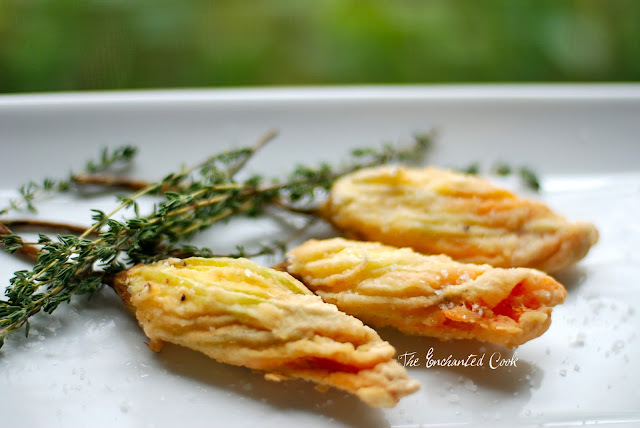 Veronica - I love squash blossoms stuffed with goats cheese - these look gorgeous. Great pics... I am totally going to try this recipe. I adore stuffed squash blossoms. They are bright, sunny & have such a delicate flavor. Yours look delicious. And, these squash blossom are similar to an italian recipe!we use fresh mozzarella to fill and a little piece of anchovies.Yum! Mozzarella and anchovies sound AWESOME! Will definitely have to try this - mmmm, love the saltiness of anchovies! 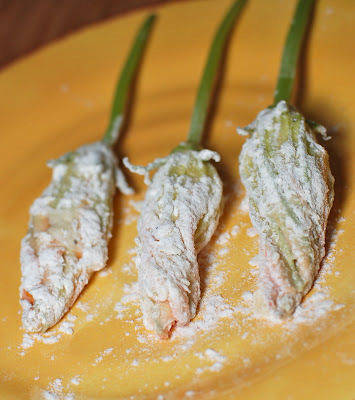 I've never tried squash blossoms...do they have a taste of their own, are do you mainly taste the filling? I may have to give this a try, but sure if they're still available here in Texas. Hi Chiara...good to see you here!! Hey Wendy - they have a very delicate zucchini-like flavor but you also get the taste of the goat cheese. It's a nice combo - kind of like cream cheese stuffed jalapenos but with the hint of zucchini and no heat, of course. How lovely! I wish I could find these blossoms here. Yum, they don't have these at are market! I'm may have to move to SoCal. I'm almost ashamed to admit that I've never tried squash blossoms. If and when I do, I will definitely use this recipe!!! interesting combination! my first time hearing about this :) thanks for sharing! have a lovely thanksgiving weekend! Oh, well, I absolutely wanna exchange with you, your blog is very nice, I like your recipes.My blog is empty: I created just to partecipate to foodie exc! I work at least 16 hours everyday, I've no time to write on my blog! Gina - you're welcome any time! Carolyn - you can also find a lot of great squash blossom recipes on Chef Dennis' blog (link in this post). He is quite the afficianado! Jen - Thank you and I hope you get to try them! Chiara - as soon as I get back from my trip, I'm signing up! !